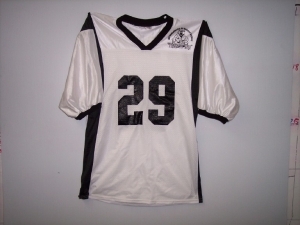 Super Tough Game Fabric Second Color Steelmesh Stripes on Side of Body and Over Shoulders Double Shoulder/Yoke Full Cut Sleeves Elastic Ribbed Gathers on Edges of Sleeves Full Length Jersey Sewn With Core-Fiber Thread Reinforced Construction Same Product for Youth is 1317. Jersey comes with logo on front and numbers on back. Minimum order of 6.